best root apps for android. 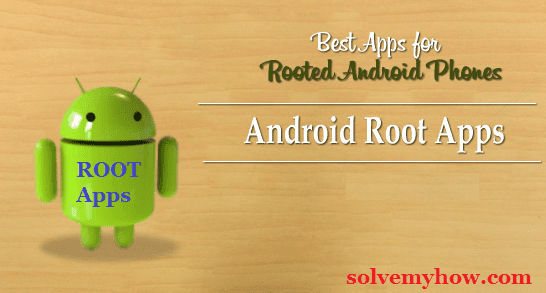 Rooted android phone will certainly gives you hundreds of benefits as it will give you admin access for your android devices. When you purchase an android phone, it will come with certain limitation and you won't be able to take full advantage of your phone as it will just give you guest access. While in guest access you won't be able to change certain things like you won't be able to install custom rom, change skin, change notification bar, personal pic in notification bar, etc. These are some limitation which can be removed once you root your android phone. When you root your phone, you will get admin access and then you will be able to download ads free and other dozens of amazing apps which needs rooted phone. You will feel as such you're inventor of your phone as you can change anything you want. PS. Once you root your phone it voids its warranty. So, kindly keep this thing in your mind. But in today's post we won't learn how to root android phone instead we will see best android root apps available. Before going further I just wanted to share some amazing android tutorials, you must wanted to read. Now lets see which are the 10 best android rooted apps, you must install in your phone. The biggest advantage of rooting android device is to block all the advertisement coming for admob or any other advertisement company. AdAway is the best way to do that. This is one of the best and powerful ad blocker available on android market. This is one of the best app to take complete backup of your android phone. This will take backup of media files, rom, contacts etc. Then you can restore all your data through this app only. Are you tired of holding power button and volume button to reboot your phone ? Guess what quick boot wants to help. Quick boot let you turn off or boot/reboot your android device into recovery or bootloader mode with just single tap. SuperSU is made for rooted android phones only and its one of the best apps ever made. It acts as a security guard for your phone. It will help you to manage apps permissions and will see that apps don't overstep their boundaries. It's constantly running in the background and waiting for apps to ask superuser permissions. Battery saving is the main problem for every android users. So greenify solves this problem. Greenify is the reason why your rooted phone can save so much battery. It can extends battery life by almost 2-4 hours. Greenify will manage the apps very intelligently, running in background. It will hibernate the apps which are in no use. This saves lot of battery. After getting a new smartphone, one of the most annoying task is to remove unnecessary apps from homepage of your phone. System app is an efficient way to uninstall those annoying app very quickly. Due to some reason, android 4.4 kitkat disabled the ability to write files to your microSD card. SDFix resolves this problem. But the only per-requisite is you must have rooted android phone. DiskDigger is the best app that will recover your corrupted or accidentally deleted data. This is the app that you might don't use until you need it. If your have just reformatted your memory card or if you have accidentally deleted a photo from gallery, then DiskDigger is the best way to get it back. Using this app you can create multiple accounts on same android device for example you can even run multiple whatsapp accounts on same android device. So these were the top 10 best roots apps for android. Hope you found this tutorial worth reading and helpful. Which is your best android root apps ? Do let me know in the comments below. You can also subscribe for solvemyhow newsletter to get instant updates about android, IOS and hacking tricks right into your inbox. Found this tutorial interesting ? Then why not help us by shooting those social media buttons on your left side, after all "sharing is caring" right !